You don't get much more retro than this. 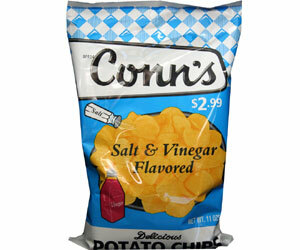 An old fashioned diner feel to an old fashioned Potato Chip. They are not widely distributed and fairly difficult to find - the people of Columbus Ohio will probably be familiar with the design, but to us, it's a little too dated to distribute anywhere else even if Conn's wanted to. These Chips were relatively thin, but that did not detract from the snap. A handful to crunch was more like a chomping experience with melt in the mouth Chips. There was not any sort of hard and firm crunch to these. These were a rather light colored Chip, with little powdery seasoning visible. It had probably been absorbed by the oil. A softer feel than with most Chips. The Nose Plunge Test revealed a tart vinegar aroma which almost erupted from the bag when it was opened. The Chips are cooked in soybean oil which may be why there was a somewhat light and fresh taste to them. Quite salty, but with an over-powering vinegar aspect to them. They were quite greasy, and the distinct impression was formed that if you had been brought up with these no other Chips would compare.